DC’s specific design, construction, and materials make sure that the user will have the accessibility to the highest level of comfort and support for their feet. These sneakers are perfect for keeping you comfortable as well as support for an active experience during the walk, running or training sessions. It is therefore perfect for sports lovers and regular practitioners. Due to the unique design and comfort based technology, the shoe has inspired many users so far. For a better understanding of this particular shoe, you may go through the following details about its features and benefits that are surely helpful for new users. DC sneakers are constructed with some of the best possible materials that are durable, long-lasting and are capable of giving you the comfort you need. The upper materials include leather, whereas the sole is made up of high-quality rubber. The inner and other parts of the sneaker consist of mesh lining, foam cushioning and a soft bed. All these materials assure to keep your foot safe, easy and active for hours of action. The overall fitting of the shoe is perfect to keep the foot stable and well-fitted inside the sneaker. This ensures that your foot will not turn or slip within the shoe even if you have quick moves to follow. The fitting of the shoe is supported by the lace-up closure that assures the user can get a customized fit no matter if the foot has somewhat different shape. The shoe will keep the foot snuggly fitted without increasing pressure on it. The shoe offers a comforting and well-designed construction for the sake of keeping the foot easy and relaxed. For the purpose of providing a long-lasting comfort during practice sessions, the shoe comes with a mesh lining that increases breathability with increased air-flow towards the inside. This assures that the foot stays dry and cool and will not cause squishy feeling due to sweating. The two drainage holes on either side of the shoe add to the comfort and breathability as they help in reducing the odors with the help of continuous air-flow as well. The inner sole also offers a unique design with some of the best techniques implemented to offer perfect support and comfort for the foot. The insole features mesh fabric lining to keep the foot free from developing sweat. In addition to that, the comfortably padded footbed keeps the foot easy, relaxed and support the natural contours for a fatigue-free experience. The collar and the tongue are specifically provided with soft padded inner to keep the foot stable and comfortable at the same time. This helps in providing support for lowering the chances of twisting and turning. The overall inner construction of the shoe also has soft padding for keeping the foot snuggly comfortable. The outsole of the shoe is made up of high-quality abrasion-free rubber that provides stability on a range of ground surfaces either smooth or rough. The sticky rubber materials assure you will not have a chance to slip at all. Due to the performance cup construction sole and the low-top shaft, the shoe offers extremely stable moves while cradling the foot in an easy way. Such a construction make sure that your foot muscles will experience the least pressure during the moves hence will not cause fatigue. The durable rubber sole is complemented with the unique Pill-Pattern design. Such a design offers stability on the ground whereas it offers quick and easy transitioning during the gait-cycle for lowered pressure and resistance on the foot muscles. It provides comfort and offers snug fitting to make sure your foot stays easy and would not hurt even after hours of running and sporting. With the drainage holes on either side and the mesh lining on the inner side, the sneakers are breathable enough to offer sweat-free and odor-free experienced while in use. The low-top shaft keeps the foot in its natural posture so that you don’t have to struggle with balancing and support. The durable materials and well-constructed inside-out design of the sneaker assure it will perform better and last longer than an average shoe. Easy to wear and easy to maintain sneaker that will not leave you disappointed. Comfort, support and luxurious feel due to padding on the collar and the tongue along with cozy inner sole. Wide inner for keeping the foot easy during the gait cycle as it offers spacious tow box. The outer sole is made to perform well on any surface as it offers stability and maneuverability with ease. • The shoe is heavier and may cause some issue for some users. 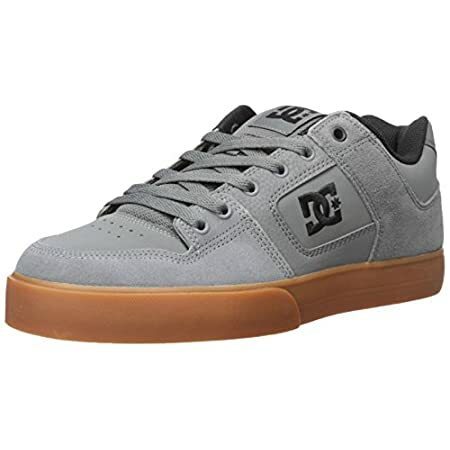 Customers of the DC shoes have always shared their love and expressed what they have experienced while wearing the shoe in a way so that others may also know what they would get. This shoe is also trusted by more than 2K customers who have rated it 4.4 stars out of 5 so far and the numbers are still increasing. Concluding our review of DC Men’s Pure Action sports sneaker, we can say that this is a perfect shoe for those looking for a low-cost, quality based, comfortable shoe. Though it feels a bit heavier as compared to other sports sneaker but this does not mean they will not let you enjoy your sports the way you want. You get all the comfort features and long-lasting support from the shoe if you have chosen the right size.